Vice and dissipation may have had their way. Meridian, Mississippi, was home to "The Father of Country Music," Jimmie Rodgers, also known as "The Singing Brakeman." It was also home to gas-station owner Danny Clark, and major-league pitchers Dennis "Oil Can" Boyd and Jay Powell. Clark's claim to fame came from baseball as well. He was an infielder with the Tigers, the Red Sox, and the Cardinals in the 1920s. Clark's parents were Manson and Addie (Cooke) Clark, native Mississippians. He was born on January 18, 1894, as Daniel Curren Clark. Manson Clark was a farmer in DeKalb, Kemper County, Mississippi, and perhaps well-off – his own father, Ranson, held properties estimated for the 1860 census at $35,000 in value. We were unable to determine when Manson Clark died, but his wife, Addie, was listed as a widow as early as in the 1911 Meridian city directory. For Clark it was a long haul to reach the major leagues, taking him 15 years and maybe longer. Accounts differ as to when he first played pro ball. He himself cited 1914 with Augusta, Georgia, on a questionnaire he completed for Boston sportswriter C. Ford Sawyer. But he is shown on the roster of the Meridian Metropolitans the year before, 1913, batting .220 in 91 games and also in 19 games at Gadsden, batting .303. Both were in Class D leagues. SABR's Minor Leagues Database had Clark playing in 1914 for Augusta in the Class C Sally League (South Atlantic League) and then putting in four years in Class A with the Birmingham Barons. His 1917 and 1918 seasons were both abbreviated, as were those of many players during the World War I years. Clark served in the US Army and was at Camp Shelby, in Hattiesburg, Mississippi, in August 1918. He may not have been that desirous of military service; when he registered for the draft in May 1917, he completed the portion of the form where it asked if there were reasons he might be exempted from service by entering "bad feet." He was in the 150th Infantry and served for a time in France, through the Armistice. With the war over, Clark was signed in January 1919 to play for Galveston in the Texas League but was perhaps not quite in playing shape; he wasn't mustered out until May and though he played in 131 games, he batted only .237. He turned things around in 1920, playing for both Galveston and then Wichita Falls and hitting .295. He wasn't sold to Wichita Falls but was loaned to them, and his departure hurt Galveston. The Wichita Falls Spudders was a Pittsburgh Pirates affiliate, and on January 19, 1921, Clark signed a contract with Pittsburgh. He went to spring training with the Pirates but was asked to put in another season with Wichita Falls. His final year before making the majors was 1921, a year he kicked off by marrying Mildred Elizabeth Cox at Fort Worth, Texas, on April 21. Clark played in 161 games for the Spudders, hit for a .325 average, and hit 19 homers, more than twice as in any prior years, and drove in 116 runs. On December 15 Clark was taken in the draft by the Detroit Tigers. Ty Cobb was the manager of the Tigers; in his first year managing, Detroit had finished in sixth place in 1921. Clark made the team during spring training in Augusta; Cobb intended to carry as many as seven infielders. Clark and Fred Haney were the utilitymen, Haney batting right-handed and Clark hitting from the left side. Clark was 5-feet-9 and listed at 167 pounds. He threw right-handed. Clark debuted on an exceptionally cold Opening Day in Cleveland, pinch-hitting for pitcher Red Oldham but making an out. In nine of the first 10 games in which he appeared, it was as a pinch-hitter; he came in for defense at second base in one of them. His third game, on April 16, saw him get his first base hit and score his first run, part of a game-tying three-run rally in the ninth. On May 6, against the visiting White Sox, Clark got his first start. He doubled in the game and collected his first RBI. Clark spent 1923 in the Southern Association, with Birmingham and then Atlanta but was ill late in the season.5 He had gotten into 140 games before taking ill, however, and hit for a .302 average. It was third base where the Red Sox needed Clark's help in 1924. He went to Hot Springs, Arkansas, for "boiling out" before joining the Red Sox at San Antonio for spring training. (Manager Lee Fohl even loaned Clark to the San Antonio Bears during one game.) 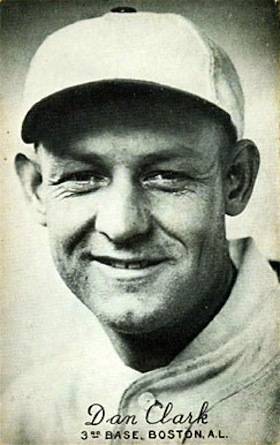 Clark made the Boston team and appeared in 104 games, batting exactly the same as the team's .277 average. In the 94 games Clark played at third base, he compiled a .943 fielding percentage – essentially the same as he'd had for the Tigers. In December 1924 the Red Sox traded with the Senators for third baseman Doc Prothro and he came through in 1925, batting .313. Also in December, Boston traded Clark to San Antonio for Ewell Gross. Perhaps San Antonio had an eye for Clark; that's where he played in 1925, back in the Texas League but this time at third base. Clark had a great year, in the Class A league, hitting safely 225 times in 564 at-bats for a .399 average, with 31 homers. In 1926 Clark advanced to Double-A, playing in the International League for the Syracuse Stars. He enjoyed another exceptional season and on September 7, the St. Louis Cardinals paid $25,000 and sent three young players to Syracuse for the rights to his contract. At the time of the transaction, Clark was hitting .362 with 32 homers. On May 16 he homered twice in the same game and then did it back-to-back on both July 8 and 9. Clark stuck with St. Louis through the full season but was not used as much as in his two prior big-league stints, nor did he have as much success. Manager Rogers Hornsby used him as one of a few reserve outfielders but both Billy Southworth and Ray Blades got more work as backups. Clark appeared in 58 games, but in all but nine of the games it was as a pinch-hitter or (once) as a pinch-runner. And he didn't hit as well as he had, batting .236 (.313 on-base percentage). He drove in 13 runs. The Cardinals finished just 1½ games behind the pennant-winning Pittsburgh Pirates. Clark went to camp with the Cards in the spring of 1928 but was released on March 10. Clark still had three more seasons of professional baseball in him, playing in Double-A for the International League's Baltimore Orioles in 1928 and 1929, and for Springfield in the Class B Three-I League in 1930. He was the manager of the Springfield Senators, assigning himself to play in 91 games. He homered 11 times and hit for a .315 average. Springfield finished fifth in the eight-team league, 16 games behind Evansville. Springfield finished first in 1931, but that was under former Red Sox teammate Bill Wambsganss and after the club had become a St. Louis Browns affiliate, taking the name Browns. Clark was out of baseball and became a gas-station operator in Meridian. Clark died at age 43, on May 23, 1937.10 Somewhat sanitized obituaries attributed death to a stroke, or did not provide a cause. His death certificate provides the cause of death as neuro syphilis and dated the disease back to January 1934.11 Had the vice and dissipation he eluded at Cooper Institute ultimately come to afflict him? In addition to the sources noted in this biography, the author also accessed Clark's player file and player questionnaire from the National Baseball Hall of Fame, the Encyclopedia of Minor League Baseball, Retrosheet.org, Baseball-Reference.com, and the SABR Minor Leagues Database, accessed online at Baseball-Reference.com. 1 Cited by Ray Vaughn at cooperinstitute-daleville.blogspot.com/. Accessed August 11, 2014. Vaughn in turn cites Laura Fairley and James Dawson, Paths to the Past, An Overview History of Lauderdale County, Mississippi (Lauderdale County Department of Archives & History, 1988). 3 New York Times, October 20, 1922. 4 Philadelphia Inquirer, November 8, 1922. 5 Boston Herald, March 3, 1924. 6 Boston Herald, May 22, 1924. 7 Boston Herald, July 10, 1924. 8 Trenton Evening Times, September 7, 1926. 9 State Times Advocate (Baton Rouge, Louisiana), December 3, 1926. 10 Oddly, the Associated Press obituary said Clark had played "with the 1927 world's champion St. Louis Cardinals" and also for Brooklyn. See, for instance, the New York Times of May 24, 1927. 11 See Standard Certificate of Death, State of Mississippi, and also Frank Russo, Bury My Heart at Cooperstown: Salacious, Sad, and Surreal Deaths in the History of Baseball (Chicago: Triumph Books, 2006), 224.